Recently, STX Heavy Industries successfully built the world’s first 45-centimetre-bore, ultra-long-stroke, low-speed engine. 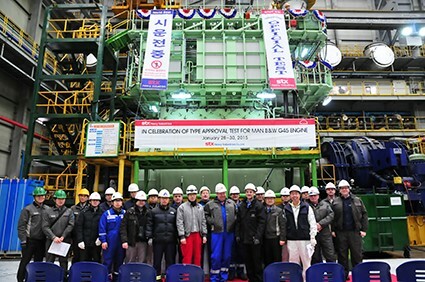 The MAN B&W 5G45ME-C9.5 engine passed its TAT (Type Approval Test) and features a fully electronically-controlled system that optimises vessels’ green profile. MAN Diesel & Turbo considers the G45 engine as an excellent choice for smaller, oceangoing ships. Development of the new engine focussed on reducing exhaust-gas emissions to a minimum, while the introduction of a fully electronically controlled system aims at optimising fuel economy. The new engine is the first in a series of eight individual main-engines bound for vessels currently under construction by Chinese shipyard NanTong Sinopacific Offshore & Engineering Co. Ltd. and ordered by Odfjell, a leading company in the global market for the transportation and storage of bulk liquid chemicals. 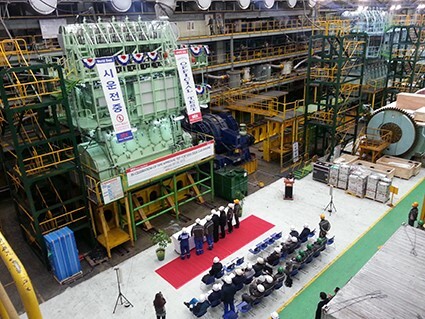 The TAT was performed at STX’s Changwon plant with the attendance of several classification societies and ship owners. MAN Diesel & Turbo offers the example of a G45 engine installed aboard an 800-teu container ship as an illustration of a typical application for the new engine type. Given a design draught of 8 metres for the vessel, a 5.7-m, four-bladed propeller could be employed. With this propeller and a service speed of 17 knots, an SMCR engine speed of about 105 rpm would be optimal and the SMCR power would approximately be 6,070 kW (with a 15% sea margin and 10% engine margin). At a normal continuous rating of 5,465 kW, a typical, modern, low-speed engine would have a specific fuel-oil consumption of 166 g/kWh, resulting in a nominal, daily fuel-oil consumption of 21.8 t/day (equivalent to a consumption of 24.3 t/day when running on HFO and including a tolerance of 5%). In contrast, applying an MAN B&W 6G45ME-C9 unit using the same parameters, the specific fuel-oil consumption would be 161.4 g/Kwh – a significant reduction in the daily fuel-oil consumption of 2.85%. Further improvements could be gained by increasing the propeller diameter to make use of the G-engines lower shaft-speed range. In this respect, increasing the propeller diameter from 5.7 to 5.9 metres, the optimal propeller speed would then become 97 rpm. However – at 97 rpm – a typical, modern, low-speed engine is no longer suitable for this application. With the larger propeller, the power requirement for 17 knots is reduced by about 1%, which translates into further fuel savings if a G-engine is used. The optimum propeller speed of oceangoing ships such as bulkers and container vessels is changing and steadily becoming lower. This is because the larger the propeller diameter that can be used for a ship, the correspondingly lower the actual propeller power and pertaining speed requirement will be, and the lower the propulsion power demand there is per ton bulk transported. These factors have an influence on which main engine type should be selected and installed as the prime mover, and also on the size of the vessel to be built. Recent development steps have made it possible to offer solutions that enable significantly lower transportation costs. One of the goals in today’s marine industry is to reduce the impact of CO2 emissions from ships and, therefore, to reduce the fuel consumption for the propulsion of ships to the widest possible extent at any load. This means that the inherent design CO2 index of a new ship, the so-called energy efficiency design index (EEDI), will be reduced. In the future, this drive will probably result in operation at lower than normal service ship speeds compared to earlier, resulting in reduced propulsion power utilisation. A more technically advanced development drive is to optimise the afterbody and hull lines of the ship, including the bulbous bow, also considering operation in ballast condition. This makes it possible to install propellers of larger diameter, thereby obtaining higher propeller efficiency, but at a reduced optimum propeller speed, i.e. using less power for the same ship speed. As the two-stroke main engine is directly coupled to the propeller, the introduction of the latest MAN B&W, ultra-long-stroke G-engine types meets this trend of installing large propellers, which may reduce the ship’s fuel consumption. Accordingly, today bulk carriers and container ships, among other vessel types, are often ordered with a G-engine type as prime mover.